Figure 9.9. Comparison of summated (A) IgG; (B) IgA; and (C) IgM HLC to total immunoglobulin concentrations by Passing-Bablok analysis. IgG HLC: 143 normal sera and 216 IgG MM patient sera (121 IgGκ and 95 IgGλ); IgA HLC: 138 normal sera and 94 IgA MM patient sera (58 IgAκ and 36 IgAλ); IgM HLC: 110 normal sera and 78 sera from patients with IgM monoclonal gammopathies. The first reference intervals for Hevylite assays were established in the Binding Site laboratories with prototype Hevylite reagents on the Siemens BN™II instrument, using different collections of normal serum samples. The results were published in a number of abstracts (Tables 10.1, 10.2 and 10.3) . In each case, there was a good correlation between the sum of concentrations measured by pairs of HLC reagents and the relevant total immunoglobulin assay (regression coefficient ranged from 0.9 to 0.997) . A publication by Bradwell et al. followed, which contained HLC reference intervals that were based on a different set of normal samples, but again using prototype reagents. Summation of Ig’κ and Ig’λ HLC results for normal sera produced a good agreement with total immunoglobulin measurements for each HLC specificity. Shortly after the publication by Bradwell et al. finalised and fully validated HLC reagents became commercially available as CE-marked diagnostic tests for use on the Binding Site SPAPLUS® (a turbidimeter) and the Siemens BNII (a nephelometer) (Section 37.3). Each product insert contains reference intervals determined using the finalised HLC reagents, as well as a comparison of the concentrations determined by summated Ig’κ and Ig’λ HLC compared to total immunoglobulin assays for a range of normal and disease state sera; all showing good agreement. Examples are shown in Figure 9.9. A summary of the results of these various reference range studies is shown in Tables 10.1, 10.2 and 10.3. From these results, it can be seen that, although there are differences between the various reference intervals for each of the Hevylite parameters, the variations are small. These are likely to reflect sampling variations (when different sets of samples are evaluated) and the use of different instruments which utilise alternative optical detection technologies, namely nephelometry and turbidimetry. Table 10.1. IgG Hevylite published reference intervals. Table 10.2. IgA Hevylite published reference intervals. Table 10.3. IgM Hevylite published reference intervals. 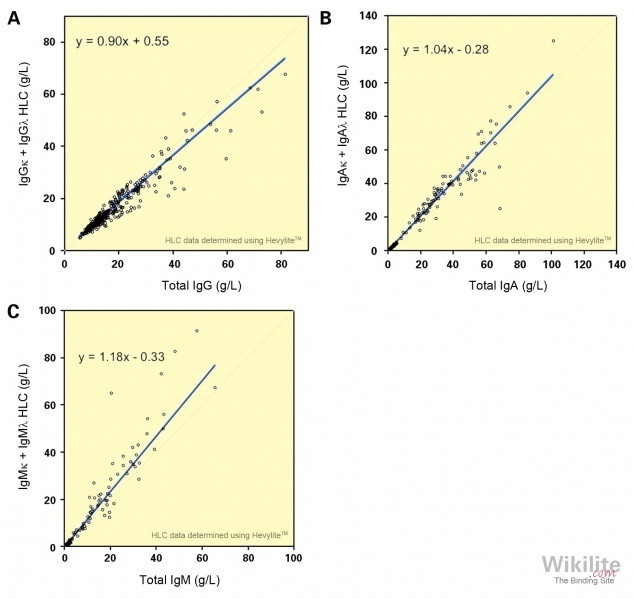 A study using enzyme-linked immunosorbent assays (ELISAs) to measure Ig’κ/Ig’λ ratios (for IgG, IgA and IgM isotypes) in pooled normal sera reported median values that are similar to those obtained with the Hevylite assays . This lends further support to the validity of the IgG HLC ratios determined by Hevylite assays. Subsequent to the release of the CE-marked HLC kits, there have been a number of studies in which the reference intervals for the Hevylite assays have been reported. Guirtarte et al. measured IgM HLC in blood donor sera on both the BNII and SPAPLUS instruments, and concluded that reference intervals on each instrument were similar, and comparable to the intervals in the product inserts. Katzmann et al. published reference intervals for all Hevylite specificities on the BNII, and commented that the reference ranges were similar to those previously published by Bradwell et al. . Katzmann et al. report similar reference intervals in their most recent publication . Here they defined both 95% and 99% reference intervals for the IgG, IgA and IgM HLC ratios, and used the 99% intervals to determine clonality. The results from these studies are summarised in Tables 10.1, 10.2 and 10.3.